Northern California went 1 for 2 in Easter Bowl girls 16 finals today. In doubles, No. 4 seeds Allura Zamarripa and Maribella Zamarripa of Saint Helena defeated No. 3 Amanda Chan of Pasadena and Chidimma Okpara of Bronxville, N.Y., 6-4, 6-4 at Indian Wells. The Zamarripa twins did not lose a set in their five tournament matches. In singles, No. 11 seed Anessa Lee of San Marino beat unseeded India Houghton of Belvedere Tiburon 6-2, 6-3. Houghton had ousted No. 1 Gianna Pielet of El Paso, Texas, in the second round. Meanwhile, Jenson Brooksby of Carmichael and Katie Volynets of Walnut Creek reached the final in boys and girls 18 singles, respectively. Both will play the top seed. Brooksby, 17, dominated Siem Woldeab of La Mesa 6-1 6-3 in a matchup of unseeded players. Brooksby has not lost more than five games in any of his five tournament matches. He will face Tristan Boyer of Altadena. Boyer topped unseeded Cannon Kingsley of Northport, N.Y., 4-6, 6-4, 6-3. The 15th-seeded Volynets, 16, beat unseeded Emma Navarro of Charleston, S.C., 6-2, 5-7, 6-2. Volynets will meet Alexa Noel of Summit, N.J. Noel routed No. 8 Gabriella Price of New City, N.Y., 6-3, 6-0. Unseeded India Houghton of Belvedere Tiburon routed Hibah Shaikh of Teaneck, N.J., 6-1, 6-3 on Friday to reach the girls 16 final in the Easter Bowl at Indian Wells. Houghton will play No. 11 seed Anessa Lee of San Marino on Saturday. Lee beat No. 8 Chidimma Okpara of Bronxville, N.Y., 6-2, 6-4. Northern California also will have a representative in the girls 16 doubles final. No. 4 seeds Allura Zamarripa and Maribella Zamarripa of Saint Helena eliminated unseeded Rosie Garcia Gross of New York and Elizabeth Goldsmith of Chula Vista 6-3, 6-2. The Zamarripa twins, who have not lost a set in the tournament, will meet No. 3 seeds Amanda Chan of Pasadena and Okpara. In the boys 16 doubles semifinals, No. 1 seeds Keshav Chopra of Marietta, Ga., and Coy Simon of Charleston, S.C., defeated No. 4 Zachery Lim of Fairfield and Alex Lin of Gold River 7-5, 6-1. Meanwhile, unseeded Jenson Brooksby of Carmichael and No. 15 seed Katie Volynets of Walnut Creek advanced to the boys and girls 18 singles semifinals, respectively. Brooksby, 17, dominated No. 11 seed Brandon Nakashima of San Diego 6-2, 6-3. Brooksby will meet unseeded Siem Woldeab of La Mesa. Woldeab surprised No. 2 Drew Baird of Holly Springs, N.C., 6-7, 7-6, 6-3. Volynets, 16, advanced by walkover against No. 11 Chloe Beck of Watkinsville, Ga. Volynets will play unseeded Emma Navarro, a resident of Charleston, S.C., who ousted No. 2 Margaryta Bilokin of New Canaan, Conn., 6-3, 6-4. In an all-Northern California final, No. 2 seed Rudy Quan of Roseville beat No. 10 Raghav Jangbahadur of Palo Alto 6-1, 6-4 on Thursday to win the boys 12 championship in the Easter Bowl at Indian Wells. Quan also won the boys 12 title in the USTA National Winter Championships at Tucson, Ariz., in January. Meanwhile, Jenson Brooksby of Carmichael and 15th-seeded Katie Volynets of Walnut Creek advanced to the boys and girls 18 quarterfinals, respectively. In the girls 16 quarterfinals, India Houghton of Belvedere Tiburon outlasted Kimberly Hance of Torrance 4-6, 6-3, 6-4. Houghton, who ousted top-seeded Gianna Pielet of El Paso, Texas, in the second round, will meet Hibah Shaikh of Teaneck, N.J. Shaikh beat Allura Zamarripa of Saint Helena 6-1, 6-4. Fourth-seeded Allura and Maribella Zamarripa downed Makayla Mills of Wilmington, N.C., and Anna Ross of Mt. Pleasant, S.C., 6-4, 6-1 in the doubles quarterfinals. In the girls 14 doubles final, No. 3 seeds Ann Guerry and Kate Sharabura, both of Atlanta, beat No. 6 Anushka Khune of Palo Alto and Tomi Main of Seaside 6-2, 7-5. No. 4 seeds Zachery Lim of Fairfield and Alex Lin of Gold River edged No. 7 Hunter Heck of Saint Paul, Min., and Maxwell McKennon of Newport Beach 5-7, 6-3 [10-8] in the boys 16 quarterfinals. Lim and Lin will take on No. 1 seeds Keshav Chopra of Marietta, Ga., and Coy Simon of Charleston, S.C.
Sloane Stephens dominated a two-time Grand Slam champion for the second straight day. But this time, there was a catch. The 13th-seeded Stephens, who grew up in Fresno, dispatched 10th-seeded Angelique Kerber 6-1, 6-2 today in 61 minutes in the Miami Open quarterfinals. Kerber, who won the Australian Open and U.S. Open champion and reached No. 1 in 2016, had less than 24 hours to recover from her two-hour, 51-minute victory over qualifier Wang Yafan of China. "I was really feeling a little bit tired today," Kerber, who has reached the quarterfinals or better in all six of her tournaments this year, admitted on wtatennis.com. "I mean, of course it was windy, it was tricky, but I have played so many matches in the last three months that I was feeling it a little bit today in my body. ... I was always one step too far away from balls, and then I make the mistakes." Meanwhile, the 12th-ranked Stephens reached her first semifinal since winning the U.S. Open last September for her first Grand Slam title. The 25-year-old resident of Fort Lauderdale, Fla., will crack the top 10 for the first time on Monday. "Finally. Oh my God," Stephens, who climbed to a career-high No. 11 in October 2013, said with a laugh. "I'm so tired of (tournament emcees) being like, "Career-high ranking, No. 11.' Like, finally I can move in there. "It's awesome. Obviously something I have wanted to do for a while, and ... it's really not easy. Getting to No. 11 was hard, and so getting into the top 10 is pretty special. I'm super excited about that." Only one month ago, Stephens trudged to Acapulco with eight consecutive losses since her stunning run to the U.S. Open title. She proceeded to reach the Acapulco quarters and then the third round at Indian Wells, losing to eventual runner-up Daria Kasatkina. In the fourth round at Miami, Stephens beat third-seeded Garbine Muguruza 6-3, 6-4 in one hour, 28 minutes on Monday. Over the past 12 months, Stephens has gone 22-5 in the United States, Canada and Mexico, and 0-9 elsewhere. Stephens will meet another two-time Grand Slam champion, wild card Victoria Azarenka, in Thursday's semifinals. Azarenka -- who won the Miami in 2009, 2011 and 2016 -- beat fifth-seeded Karolina Pliskova 7-5, 6-3. Azarenka, formerly ranked No. 1, is playing in only her second tournament since Wimbledon last July because of a custody battle over her 1-year-old son, Leo. The 6-foot (1.83-meter) Azarenka, who's five inches (12.7 centimeters) taller than Stephens, leads their head-to-head series 3-1. But Stephens won the last meeting 6-1, 7-5 in the second round at Indian Wells this month. Each of Azarenka's victories has come in straight sets in the Australian Open. The other women's semifinal matchup will be determined Wednesday. No. 4 seed Elina Svitolina of Ukraine is scheduled to face No. 6 Jelena Ostapenko of Latvia at 10 a.m. PDT, and No. 8 Venus Williams of Palm Beach Gardens, Fla., will meet qualifier Danielle Collins of St. Petersburg, Fla., at 4 p.m. ESPN2 will televise both matches. Williams won the Miami title in 1998, 1999 and 2001. Men's Futures -- Four Europeans who starred at Northern California universities met in the doubles final of the $25,000 USTA Men 's Pro Tennis Championships of Calabasas in the Los Angeles area on Sunday. Unseeded former Cal teammates Andre Goransson of Sweden and Florian Lakat of France topped second-seeded Bernardo Saraiva (University of San Francisco) of Portugal and Sem Verbeek (Pacific) of the Netherlands 6-2, 7-6 (3). The singles final featured an all-Los Angeles area matchup. No. 7 seed J.C. Aragone of Yorba Linda beat No. 4 seed and 2014 champion Marcos Giron of Thousand Oaks 6-2, 6-4. 6-3, 6-2 to win the BNP Paribas Open at Indian Wells. 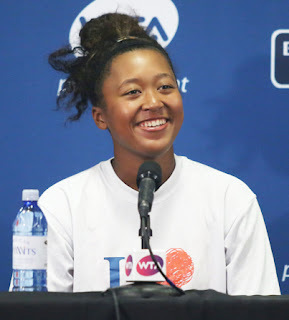 Naomi Osaka of Japan announced herself as a potential Grand Slam champion by routing Daria Kasatkina of Russia 6-3, 6-2 today in an unlikely matchup of 20-year-olds to win the BNP Paribas Open at Indian Wells. But Osaka's first big win came four years ago at Stanford. As a 16-year-old qualifier playing her first main-draw match on the WTA tour, Osaka ousted 2011 U.S. Open champion Samantha Stosur 4-6, 7-6 (7), 7-5 in the first round of the Bank of the West Classic. Osaka saved a match point in the tiebreaker and overcame a 3-5 deficit in the third set. She then fell to eighth-seeded Andrea Petkovic 6-2, 6-2. In today's men's final, sixth-seeded Juan Martin del Potro of Argentina saved three match points in a 6-4, 6-7 (8), 7-6 (2) victory over top-ranked Roger Federer. Del Potro, who almost quit tennis after undergoing four wrist operations in recent years, handed Federer, who was seeking a record-breaking sixth Indian Wells title, his first loss of the year after 17 wins. Del Potro also beat Federer in the 2009 U.S. Open final but trails 18-7 in the head-to-head series. Osaka was born in Japan to a Haitian father and Japanese mother. She moved to the United States at 3 and has trained at the Evert Tennis Academy in Boca Raton, Fla., for the past two years. Unseeded at Indian Wells, Osaka defeated two-time champion Maria Sharapova, former world No. 2 Agnieszka Radwanska,, former No. 1 Karolina Pliskova and current No. 1 Simona Halep en route to the title. In the final, Osaka dismissed the 20th-seeded Kasatkina in 70 minutes to win her first title at any professional level. "We've seen the power," ESPN commentator Chris Evert said of the 5-foot-11 (1.80-meter) Osaka's game. "What we hadn't seen is the consistency and the court coverage." Osaka recently began working with Sascha Bajin, formerly Serena Williams' hitting partner. "I give Sascha a lot of credit," Evert told the New York Times. "He knew what she lacked, what she needed. Her movement is noticeably different." Osaka earned $1,340,860, almost double her career earnings of $1,483,053. She will jump from No. 44 in the world to a career-high No. 22 in Monday's updated rankings. Kasatkina will rise eight spots to a career-high No. 11. BNP Paribas announced that it has extended its title sponsorship of the tournament for five years. The worldwide bank will become the longest-running title sponsor in the event's 42-year history. Bob and Mike Bryan aren't just enduring a Grand Slam title drought. The ex-Stanford stars also are suffering a dry spell in Masters 1000 tournaments, the highest level after the Slams. Unseeded John Isner and Jack Sock edged the seventh-seeded Bryans 7-6 (4), 7-6 (2) today in an all-American final in the BNP Paribas Open at Indian Wells. The Bryans, who will turn 40 next month, haven't won a Grand Slam men's doubles title since the 2014 U.S. Open or a Masters 1000 crown since the 2016 Italian Open. Their most recent title of any kind came in Atlanta last July. The Bryans were seeking their third Indian Wells title, having triumphed in 2013 and 2014. Meanwhile, Sock won his second Indian Wells doubles crown and Isner his first. "It's pretty special," Isner, the 2012 singles runner-up to Roger Federer at Indian Wells, told reporters. "I think more importantly for Jack and (me), (it's) just getting that winning feeling back. Admittedly, both of us have not played singles that well this year." Sock and Canada's Vasek Pospisil won Wimbledon in 2014 and Indian Wells in 2015. They also reached the BNP final in 2016, losing to Frenchmen Pierre-Hugues Herbert and Nicolas Mahut. Isner and Sock became only the third team in the past 30 years to win the Indian Wells title without losing a set. Jonathan Erlich-Andy Ram (2008) and Rafael Nadal-Marc Lopez (2012) also accomplished the feat. Isner and Sock received a walkover against Roberto Bautista Agut and David Ferrer in the second round after the Spaniards had ousted top seeds and 2017 runners-up Lukasz Kubot and Marcelo Melo. Isner and Sock also beat eighth-seeded Ivan Dodig and Rajeev Ram in two tiebreakers in the quarterfinals. Ram won last year's title with Raven Klaasen. Sam Querrey could have achieved two milestones with a victory today. Instead, the 30-year-old San Francisco native lost to resurgent Milos Raonic 7-5, 2-6, 6-3 in the quarterfinals of the BNP Paribas Open at Indian Wells. Querrey, seeded 18th, served for the first set at 5-4 but netted a backhand volley on break point, and Raonic, seeded 32nd, capitalized. The 6-foot-5 (1.96-meter) Raonic blasted 17 aces in the match, and the 6-foot-6 (1.98-meter) Querrey had nine. Raonic, the 2016 runner-up to Novak Djokovic, reached the BNP final for the third consecutive year. Querrey, with a win, would have advanced to his first Masters 1000 (the highest level after the Grand Slams) semifinal and cracked the top 10 for the first time, jumping from No. 21 to No. 10. Querrey was No. 11 before losing in the first round at Acapulco as the defending champion in the week before Indian Wells. Raonic, the 2016 Wimbledon runner-up to Andy Murray, has battled injuries over the years. He had surgery on his right hip in 2011, right foot in 2015 and left wrist last year. He also struggled with a right leg injury for much of last year, missing the U.S. Open. Ranked a career-high No. 3 in November 2016, Raonic has tumbled to No. 38. Saturday's men's doubles final will be an all-American showdown between seventh-seeded Bob and Mike Bryan and unseeded John Isner and Jack Sock. The Bryan twins, former Stanford stars who will turn 40 next month, topped unseeded Pablo Cuevas of Uruguay and Horacio Zeballos of Argentina 7-6 (5), 6-4. Isner and Sock dismissed third-seeded Oliver Marach of Austria and Mate Pavic of Croatia 6-3, 6-2. Marach and Pavic won the Australian Open in January. WTA tour -- Madison Keys and CoCo Vandeweghe, the finalists in last summer's Bank of the West Classic at Stanford, have entered the inaugural Mubadala Silicon Valley Classic at San Jose State. Keys defeated her close friend Vandeweghe 7-6 (4), 6-4 for the Bank of the West title. The Mubadala tournament is scheduled for July 30-Aug. 5. Five new members of the Northern California Tennis Hall of Fame will be inducted during a luncheon on July 27 from 10:30 a.m. to 1:30 p.m. at the Peninsula Golf and Country Club in San Mateo. Enshrined will be Mike Bauer, Dana (Gilbert) Heinemann, Tad Taube, Rich Andrews and Wendell Pierce. Bauer, a former Cal All-American, reached No. 29 in the world in 1984. He won three singles and nine doubles titles on the ATP Tour. Heinemann, the older sister of Brad Gilbert, climbed to No. 46 in the world in 1983. She captured two singles and one doubles title on the WTA tour. Taube, a San Francisco Bay Area philanthropist, had Stanford's tennis facility named after him. The Taube Family Tennis Stadium hosted the Bank of the West Classic on the WTA tour from 1997 through last year. In its place, the first Mubadala Silicon Valley Classic is scheduled for July 30-Aug. 5 at San Jose State's Spartan Tennis Complex. Andrews, now retired, coached in Sacramento, and Pierce is a teaching pro in the Bay Area. If Sam Querrey entertained any thoughts of pocketing the $1 million bonus for sweeping the singles and doubles titles in the BNP Paribas Open, he can forget them. Querrey, a 30-year-old San Francisco native, and Gilles Muller, a 34-year-old left-hander from Luxembourg, lost to Pablo Cuevas of Uruguay and Horacio Zeballos of Argentina 6-4, 6-4 today in the quarterfinals at Indian Wells. Querrey is very unlikely to win the singles title anyway. Seeded No. 18, he will meet No. 32 Milos Raonic, the 2016 runner-up to Novak Djokovic, on Friday at noon (ESPN) in the quarterfinals. Also, looming are sixth-seeded Juan Martin del Potro in Querrey's half of the draw and top-seeded Roger Federer in the other half. No other man or woman remains alive in both singles and doubles. Cuevas and Zeballos are scheduled to face seventh-seeded Bob and Mike Bryan on Friday at about 4 p.m. The Bryan twins, former Stanford stars who will turn 40 next month, seek their third Indian Wells title. No. 18 seed Sam Querrey, a 30-year-old San Francisco native, outlasted qualifier Yuki Bhambri of India 6-7 (4), 6-4, 6-4 today in the third round of the BNP Paribas Open at Indian Wells. The 6-foot-6 (1.98-meter) Querrey hammered 17 aces and won 83 percent of the points on his first serve (40 of 48) in the 2-hour, 22-minute match. Querrey equaled his best result at Indian Wells in his 13th appearance. He also reached the fourth round in 2011 and 2013. Querrey is scheduled to play No. 28 seed Feliciano Lopez of Spain for a quarterfinal berth on Wednesday not before 6 p.m. PDT (Tennis Channel) in 8,000-seat Stadium 2. Lopez, a 36-year-old left-hander, held off No. 8 Jack Sock of Kansas City, Kan., 7-6 (6), 4-6, 6-4 in a 2-hour, 25-minute night match in Stadium 1. Lopez leads Querrey 6-4 in their head-to-head series, but Querrey won the last meeting 6-3, 6-4, 6-2 in the first round of the Australian Open in January. In the women's fourth round at Indian Wells, fifth-seeded Karolina Pliskova of the Czech Republic downed 16-year-old U.S. phenom Amanda Anisimova 6-1, 7-6 (2). Anisimova, who won the $60,000 Sacramento Challenger last July, had beaten No. 9 seed and two-time Wimbledon champion Petra Kvitova in the third round. Anisimova ended Kvitova's winning streak at 14 matches. No. 7 seeds Bob and Mike Bryan, former Stanford stars and two-time Indian Wells champions, dismissed Spaniards Pablo Carreno Busta and David Marrero 6-2, 6-3 to reach the quarterfinals. Obituary -- Ken Flach, who ascended to No. 1 in the world in doubles in 1985, died from complications of pneumonia on Monday in San Francisco at age 54. Flach, a St. Louis native who lived in Mill Valley in the San Francisco Bay Area, won six Grand Slam titles (four in men's doubles and two in mixed doubles) and claimed the men's doubles gold medal at the 1988 Olympics in Seoul with longtime partner Robert Seguso. Sloane Stephens' post-U.S. Open letdown continued today with a mild upset. 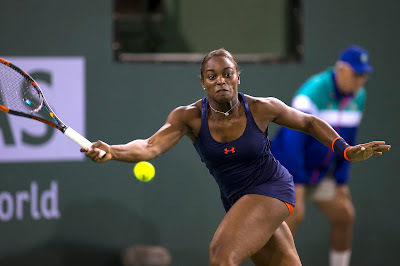 Stephens, seeded 13th, lost to Daria Kasatkina, a 20-year-old Russian seeded 20th, 6-4, 6-3 in the third round of the BNP Paribas Open at Indian Wells. "I mean, not going to be too down about it," Stephens told reporters following the afternoon match in 16,100-seat Stadium 1. "There's always next week and the week after." Stephens, a 24-year-old Fresno product, fell to 3-10 since winning her first Grand Slam title last September. All three victories have come in her last two tournaments. She reached the quarterfinals in Acapulco the week before Indian Wells. Kasatkina, ranked 19th, has beaten all four of the current Grand Slam champions in the last year: Jelena Ostapenko (French Open), Caroline Wozniacki (Australian Open), Garbine Muguruza (Wimbledon) and Stephens. Kasatkina is scheduled to meet Wozniacki, seeded second, on Tuesday in 8,000-seat Stadium 2 not before 6 p.m. for a quarterfinal berth. Sam Querrey, a 30-year-old San Francisco native, reached the doubles quarterfinals with Gilles Muller, a 34-year-old left-hander from Luxembourg. They upset fourth-seeded Jamie Murray of Great Britain and Bruno Soares of Brazil 7-5, 6-7 (4) [10-2]. Muller and Querrey will play the winner of Tuesday's match between fifth-seeded Pierre-Hugues Herbert and Nicolas Mahut, the 2016 champions from France, and Pablo Cuevas of Uruguay and Horacio Zeballos of Argentina. Wild card Amanada Anisimova, who won the $60,000 Sacramento Challenger at 15 last July, ousted ninth-seeded Petra Kvitova 6-2, 6-4 today in the third round of the BNP Paribas Open at Indian Wells. Anisimova, from Aventura, Fla., became the first 16-year-old to reach the fourth round at Indian Wells since wild card Viktoriya Kutuzova of Ukraine in 2005. Kvitova, a two-time Wimbledon champion, had her winning streak ended at 14 matches. After receiving a first-round bye, the 28-year-old Czech left-hander outlasted Yulia Putintseva of Kazakhstan 6-7 (4), 7-6 (3), 6-4 in 3 hours, 17 minutes, the longest match on the WTA tour this year. Anisimova became the third young American woman to pull off a big upset at Indian Wells this year. In the second round, 22-year-old qualifier Sachia Vickery knocked off third-seeded Garbine Muguruza, a two-time Grand Slam champion, and 24-year-old wild card Danielle Collins eliminated 15th-seeded Madison Keys, last year's U.S. Open runner-up to Sloane Stephens and Bank of the West Classic champion at Stanford. Caroline Dolehide, 19, almost joined the list, falling to top seed and 2015 BNP champion Simona Halep 1-6, 7-6 (3), 6-2. Stephens, a Fresno product seeded 13th, beat wild card Victoria Azarenka, the 2012 and 2016 BNP champion, 6-1, 7-5 in a second-round match that had been postponed by rain. Azarenka, who remains alive in doubles, had not played a tournament since Wimbledon last July because of a custody battle over her 1-year-old son, Leo. On the men's side, qualifier Taro Daniel of Japan ousted 10th seed and five-time champion Novak Djokovic 7-6 (3), 4-6, 6-1 in the second round. Djokovic had minor surgery on his right elbow after losing to 21-year-old Hyeon Chung of South Korea in the fourth round of the Australian Open in January. No. 18 seed Sam Querrey, a 30-year-old San Francisco native, topped Mischa Zverev of Germany 6-4, 7-5. After two rounds, Querrey, No. 8 Jack Sock and 20-year-old Taylor Fritz are the only remaining Americans in men's singles. Anisimova, who won the U.S. Open girls singles title last September, is scheduled to play fifth-seeded Karolina Pliskova on Tuesday for a quarterfinal berth. Anisimova was born in Freehold Township, N.J., to Russians Konstantin Anisimov and Olga Anisimova. Amanda speaks Russian at home but as of last fall had never been to her parents' homeland. No. 24 seed and defending champion Elena Vesnina of Russia beat CiCi Bellis, an 18-year-old product of Atherton in the San Francisco Bay Area, 2-6, 6-1, 6-1 today in the second round of the BNP Paribas Open at Indian Wells. Vesnina, 31, received a first-round bye before facing Bellis for the first time. "I'm really happy that I won this (first) match," Vesnina told reporters. "It's never easy to play first match in any tournament, and in this tournament especially for me. "CiCi, she's having a great season. She's only 18 years old. 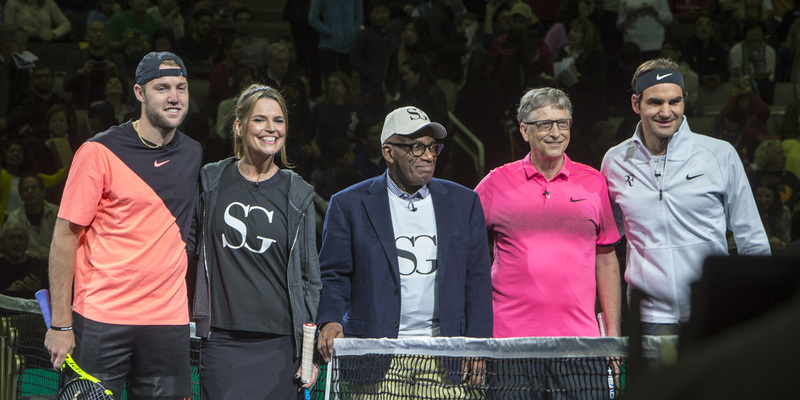 When they announced that and they said her highest ranking is 35 in the world, I was like, Whoa, that's impressive. "She has a bright future. She's a really talented girl, good fighter. Yeah, I'm just happy that I won this match." After playing in 16,100-seat Stadium 1 in her first two career matches at Indian Wells, the 45th-ranked Bellis played Vesnina in Stadium 4. Oddly, No. 3 seed Grigor Dimitrov faced Fernando Verdasco in Stadium 1 instead. Verdasco, a 34-year-old left-hander who won the 2010 SAP Open in San Jose, prevailed 7-6 (4), 4-6, 6-3. The late match between No. 13 seed Sloane Stephens and wild card Victoria Azarenka was postponed by rain until Sunday not before 12:30 p.m.
Stephens, who grew up in Fresno, has slumped badly since winning her first Grand Slam title in the U.S. Open last September. Azarenka reached No. 1 in the world in 2012 and won the BNP Paribas Open that year and in 2016. Azarenka is playing in her first tournament since Wimbledon last July because of a custody battle over her 1-year-old son, Leo. In a first-round battle of brothers, former Stanford stars Bob and Mike Bryan defeated Alexander and Mischa Zverev 6-3, 4-6 (10-1). The seventh-seeded Bryans seek their third Indian Wells title. CiCi Bellis wasted no time setting up a match against defending champion Elena Vesnina in the BNP Paribas Open, considered the "fifth" Grand Slam tournament. Bellis, an 18-year-old San Francisco native who grew up in nearby Atherton, dismissed qualifier Sara Sorribes Tormo of Spain 6-0, 6-3 in 65 minutes today in the first round at Indian Wells. The afternoon match was played in at 16,100-seat Stadium 1. It was Bellis' first victory in the BNP Paribas Open. In her tournament debut last year, she lost to 2013 Wimbledon semifinalist Kirsten Flipkens of Belgium 4-6, 6-1, 6-4 after leading 3-0 (one service break) in the final set. That match also was played at Stadium 1, as Bellis' first encounter with Vesnina undoubtedly will be on Saturday. Vesnina, ranked and seeded 24th, received a first-round bye. Bellis, ranked 45th, is by far the youngest player in the top 50. She's 22 months younger than No. 6 Jelena Ostapenko and 23 months younger than No. 19 Daria Kasatkina. However, No. 54 Marketa Vondrousova almost three months younger than Bellis. They reached the French Open girls doubles final in 2014, losing 6-1, 5-7 [11-9] to Romanians Ioana Ducu and Ioana Loredana. Roger Federer hits a backhand volley during Monday night's exhibition. 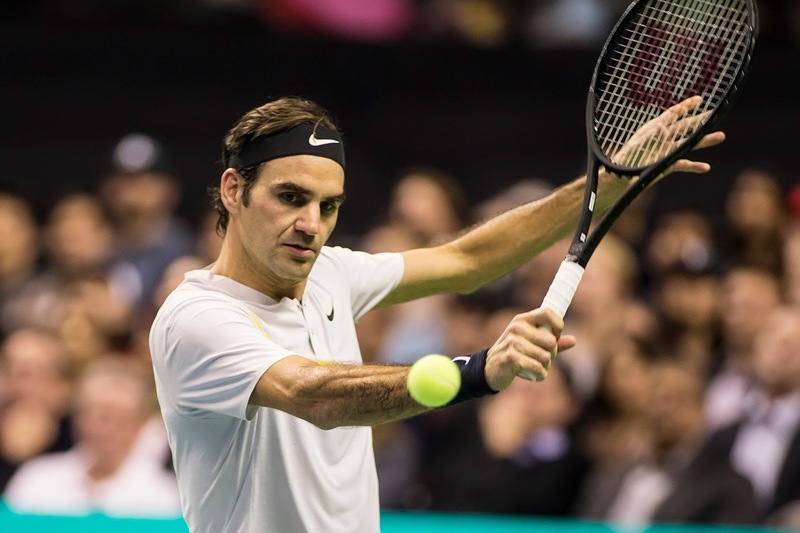 Playing in Northern California for the first time, Roger Federer defeated Jack Sock 7-6 (9), 6-4 tonight in a lighthearted exhibition before a sellout crowd of 17,496 at SAP Arena in San Jose. At 36, Federer last month became the oldest man or woman to earn the No. 1 ranking. He broke the marks of Andre Agassi (33) and Serena Williams (35). "Those are definitely special times in my life and my career," Federer told reporters. "The dream as a little boy was to make it one day to world No. 1, but not at 36 years old -- I can tell you that. It was probably at some point at 25 maybe if things went really well. "I had a tough year in 2016 with my knee and stayed positive, was resilient and fought to come back and really believed I could actually win again. I didn't think it was going to be at this level. It's been an unbelievable journey the last 14 months, and my team has been incredible. I'm loving every moment that I can still play on tour because you never know when it's going to end." 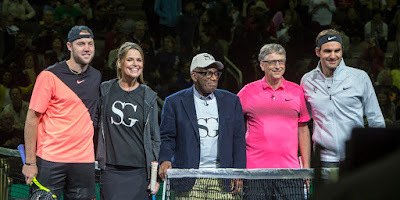 Earlier tonight, Federer and Bill Gates beat Sock and "Today" hostess Savannah Guthrie 6-3. The $2,500 Rio del Oro Open/Senior/NTRP, a Sacramento tournament featuring four current or former professional players, ended prematurely on Sunday because of rain. All three open doubles events were completed, but men's and women's open singles were halted in the quarterfinals and semifinals, respectively, at the Rio del Oro Racquet Club. Tournament director Todd Stanley said work, school and tournament commitments prevent those draws from finishing. Advancing to the men's open singles quarters were No. 1 seed Alexios Halebian of Glendale, No. 2 Leonardo Kirche of Granite Bay, No. 4 Anton Stryhas, No. 5 Stefan Leustian of Mather, No. 5 Nitzan Ricklis of Sunnyvale, No. 5 Stevie Gould of Corte Madera, No. 5 Max Pham of Newport Coast and No. 9 Cambell Nakayama of San Francisco. Halebian, a 23-year-old left-hander, is ranked No. 686 in the world. He qualified for Washington on the elite ATP World Tour last August and lost to Lukas Lacko, a Slovakian now ranked No. 103 after reaching a career-high No. 44 in 2013, 6-3, 6-4 in the opening round. Kirche, a 33-year-old Brazil native, climbed to a career-high No. 196 in 2013. He played one Davis Cup match, beating Mauricio Echazu of Peru 6-2, 6-1 in the fifth match of Peru's 4-1 victory in 2004. Unseeded Dan Goldie, a 54-year-old resident of Los Gatos who peaked at No. 27 in the world in 1989, lost in the second round to ninth-seeded James Roberts of Sacramento 7-5, 5-7 [11-9]. The semifinal matchups in women's open singles were No. 1 seed Oleksandra Andrieieva of San Jose against No. 4 Jillian Taggart of Fair Oaks and unseeded Maryia Hrynashka vs. unseeded Deimante Bulatovaite of Sacramento. Winning doubles titles were Halebian and Benjamin Keyser of Vienna, Va., Taggart and Elena Van Linge of Menlo Park, and Rajan Bhatia of Benicia and Allie Will of Modesto. Each team was seeded first. Will, 26, reached a career-high No. 98 in the world in women's doubles in 2014. Stephanie Voegele, ranked 183rd, stunned top-seeded Sloane Stephens, ranked 13th, 6-4, 5-7, 6-2 on Thursday in the quarterfinals of the Abierto Mexicano Telcel in Acapulco. Voegele, a 27-year-old Swiss, improved to 3-1 against Stephens, a 24-year-old Fresno product. Like Stephens, Voegele arrived in Acapulco seeking her first win in the main draw of a WTA tournament this year. Stephens had lost eight straight matches since winning the U.S. Open in September for her first Grand Slam title. Stephens beat Pauline Parmentier of France in straight sets in the first round and saved a match point in her three-set victory over Dutch qualifier Arantxa Rus in the second round. Voegele, who reached a career-high No. 42 in 2013, will play Swedish qualifier Rebecca Peterson in the semifinals.